I am a bit of a skeptic, so when I initially saw the Kinesio Pre-Cut Dynamic Foot Support extreme skepticism was my initial response. Having suffered from Plantar Fasciitis for the past four years, and after seeking treatment for three of those years, I had in my hand yet another product that claims relief from foot pain. Constant pain in my right heel had become a fact of life for me. As the father of four children, inactivity is not an option. Just mentioning a trip to Disney World or a concert, I would immediately experience shooting pains from my heel thinking of the impending standing and walking. In 2010, when I first visited my podiatrist, I was willing to do anything for some relief: faithful execution of the prescribed exercises, 6 cortisone injections, off the shelf orthotics, custom orthotics, Croc shoes (at the expense of getting made fun of), and 15 lbs. of lost weight. Finally, in 2013 I had the surgery that I hoped would be the ultimate end to the chronic pain. When that failed, my skepticism of any product claiming relief from foot pain reached an all-time high. In desperation, and because the financial risk was so low, I decided to give one more product a try. The blue tape is a single solid piece that is applied perpendicular to, and over top of, the pink tape. On the back of the blue tape is a center line marker so you know where to cut it in half. (*This was the only confusion that I experienced with the Kinesio Pre-Cut Dynamic Foot Support.) After I cut the blue tape in half, I noticed that it wouldn’t wrap around my foot like it did in the picture. With my foot size, men’s size 12, I wondered if maybe I was supposed to cut it longer, and discard of the other piece. But because the packaging includes two pink tapes and one blue tape, I realized that they had provided me with two separate treatments, or one treatment for each foot. By not cutting the blue tape exactly in half I would only get one treatment. If you are like me, generally looking at the pictures on the directions to see how to put things together instead of fully reading the directions, you’ll miss some vital information: you may need help applying the Kinesio Pre-Cut Dynamic Foot Support, and you must thoroughly wash and dry your foot before applying. Thank goodness that my skepticism and desperation for relief caused me to not only look at the pictures, but to read the accompanying directions as well. Don’t skip the instructions. With my foot washed and dried, I was ready to give it a try. Unfortunately no one was home to help me apply the Kinesio Pre-Cut Dynamic Foot Support. The application was pretty straight-forward for me, but as the directions state, help definitely would have made it easier. For those with limited mobility or compromised range-of-motion, help will be required. I can’t say that as soon as I put the Kinesio Pre-Cut Dynamic Foot Support on, I felt pain relief. But I didn’t expect to. What I did notice was that when I stood up after a long period of sitting, I experienced a noticeable amount of pain relief. In fact, I didn’t feel much pain for the rest of the day. I was amazed…and a bit confused. What was causing the decreased pain? Why was a simple product like tape helping my heel pain? Is this too good to be true? Kinesio states that: “The tape lifts the skin to form convolutions, increasing the space between the fascia and the muscles. This promotes the flow of lymphatic fluid, thereby helping to reduce associated swelling.” While I was initially doubtful, my experience caused me to believe that this must, in fact, be what had happened inside my foot. Not expecting these results, and still a bit skeptical, I decided to start the test over. During my initial application, I failed to cut the tails of the pink tape that went up on to my toes. This caused the tape to begin to peel off prematurely and stick to my sock. When I removed my sock, the tape stuck to it and pulled the whole tail off my skin (if I had read the directions really carefully, they clearly state to use caution when removing socks and shoes). Because of my initial positive results, I was determined to REALLY follow the instructions and document my experience. To be sure that this wasn’t a coincidence – that the tape really did alleviate my pain – I waited a full day until my heel pain had returned to it’s typical level of discomfort before reapplication. With the pain back, and a new Kinesio Pre-Cut Dynamic Foot Support in hand, I applied it EXACTLY how the directions recommended. This time I used a pen to mark my foot and tails for proper cutting. 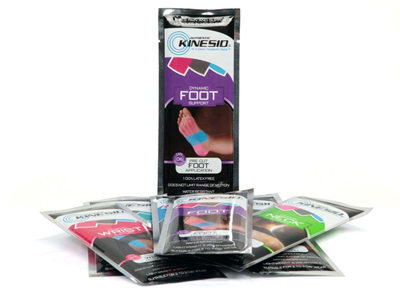 Kinesio states that the Dynamic Foot Support is water resistant and can be worn for 2-3 days. I was going to find out. After 48 hours of continual use, I am convinced that this product really does work. I have successfully worn the Kinesio Pre-Cut Dynamic Foot Support through two pairs of sweaty socks, two showers, and two days of barefoot walking on hardwood flooring (yes I know that is bad for Plantar Fasciitis, but I was doing a test). I experienced pain relief throughout the work day. I was also able to attend a concert – standing for over three hours – without major pain. The concert took me from skepticism to absolute belief that this product really does do it what it claims to do. I will definitely be purchasing the Kinesio Pre-Cut Dynamic Foot Support in the future. In my situation, I cannot afford to wear them on a daily basis. With a retail price of $8.00 + tax (US) for a package of two, it would cost me $730 + tax a year to wear these every day. (I would need to add a new column to my financial budget to incorporate this into my daily routine.) However, I will definitely apply Kinesio Pre-Cut Dynamic Foot Support before heading to an amusement park, concert, or sporting event. Thank you, Kinesio, for the assurance that I can be active without pain!